For this month's Genealogy Blog Party, tell us about a mistake you've made in your genealogy research, how you discovered it, and ultimately, how you solved it. The point, of course, is for others to learn from the mistakes you made, so they don't have to learn it the hard way. Instead of just one, I'll admit to having made a handful of mistakes. 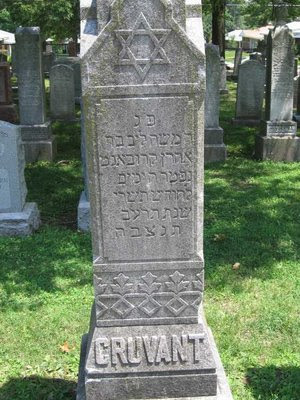 1) The first one is illustrated by two photographs of the same gravestone. Front and Back. Just like a photograph, a tombstone has a backside. Make sure you look. 2) Here's another mistake I made in a cemetery. You may be searching for one tombstone in particular, but don't be in such a hurry that you don't look around at neighboring stones. That pretty much goes without saying, but I did so without realizing it, and correcting the mistake wasn't simple. Not only did I have to remove the data from the entry, I had to remove the cached pages on multiple search engines. Each search engine has different procedures for removing a page. 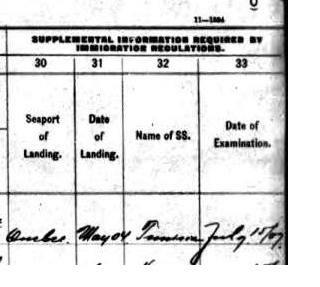 I originally read the manifest clipping above to indicate the passengers (a great grandfather, and a great great grandfather) landed in Quebec in May of 1904 on the Tunisian, and crossed the Canadian border into the US on July 15, 1907. I knew that 4s and 7s often look similar, but the document is in a single individual's handwriting. The year in column 31 is definitely a different number than the year in column 33. Well, it looks that way. But, no. I found the manifest for the Tunisian from May of 1907. My ancestors were only in Quebec for two months. I've made other mistakes, but that's enough for now. You've been brave enough to share some mistakes you've made along the way - thank you, as you are right. Others may learn from them. I shared my biggest "duh" moment, which wasn't a mistake I made, but instead showing how sometimes we need to think outside the box. I am loving Elizabeth's blog party. I hope it sticks around for a while. Thank you for sharing these mistakes so others can learn. I've missed family in cemeteries before and although they're both close enough that I can visit again, neither is exactly a hop, skip and jump away. This was such a thought-provoking post and much appreciated. I can say I've walked in these same "duh" shoes myself. Genealogy is a learning process, isn't it? I've made 3 of those mistakes. I was especially irritated about missing family buried in a cemetery I had recently visited. Like you, I discovered my mistake when I got home and looked at my photos - there they were, sitting right behind the marker I had photographed. DUH. Sadly, the cemetery is in TN, and I'm in CA - not an easy mistake to fix. To this day, I haven't been back, but I've managed to get some photos courtesy of a few kind Find A Grave volunteers. Thank you for sharing thing to avoid. I feel like I've made everyone of those mistakes. The worst was assuming that someone born 106 years ago was dead. He wasn't! Related to that, the top regret many genealogists have is not interviewing the older generation in time. Thanks for sharing your mistakes - I've made #4 more than once, unfortunately. The tombstone ones were interesting - my family doesn't have many stones so I wasn't aware that some have writing on the back!